There is such a wide variety of building blocks for kids these days. I can remember growing up with Lego’s and Lincoln Logs when we actually came up with our own unique creations. They were always so much fun to play with and definitely was great for the imagination. The difference between those and nanoblock is that nanoblocks are the world’s smallest building blocks. My son does not have any nanoblocks so it was fun for my him to try them out and build something with them. We were sent the P-51 Mustang, an American Fighter plane, to review. My son was instantly sold on the idea of building any type of planes. He is obsessed with planes! The level of difficulty on it is a 3 on a scale from 1-5 with 5 being the most difficult. This item includes over 480 pieces! My son is 8 and was easily able to build his 3D model with the micro-sized building blocks. The nanoblocks offer more details than other building blocks for kids. 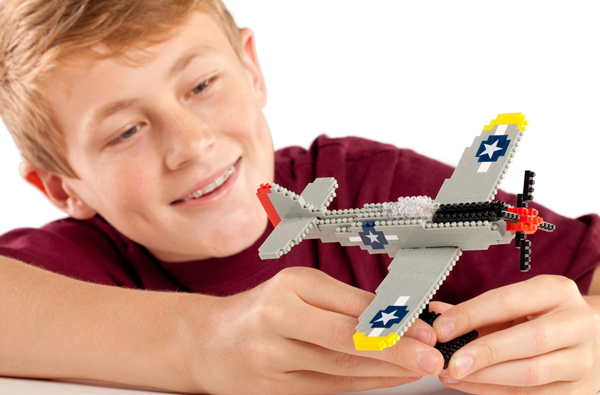 You can easily create replicas of your favorite things like the P-51 Mustang. I like how it gives more detail about the piece you are creating on the back of the box. A great history lesson my son enjoyed! Once assembled, the P-51 Mustang can fit perfectly in the palm of your hand. The finished size is 6.25″ wide x 7.28″ deep x 4.3″ high. Definitely pint-sized! Not intended for children under 8 years old. Recommended for ages 14+. Introducing the world’s smallest building blocks! Developed in Tokyo, nanoblock has a patented double feather design to lock pieces firmly together and let you build in greater detail than ever before. Each set includes anywhere from 100 pieces to more than 5800 pieces. Try nanoblock, the biggest little block in the nanoverse! This would be a great gift for my grandson. He could play with these things for hours. He just loves doing things with his hand so much.